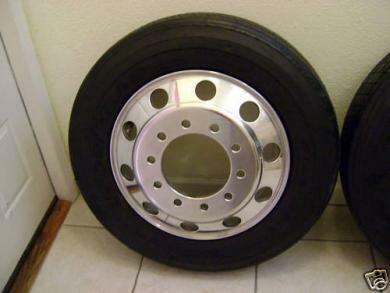 Up for sale is a set of six (6) 24 x 5 inch Freightliner Dually Wheels. These wheels were original 24.5 and refinished in triple chrome. These wheels are in perfect condition and have only 7000 miles. Triple chromed wheels that have been polished every week since the day I got them. Wheels have never been scratched or scuffed. They are in perfect condition and have nothing wrong with them. Adapters turn your 8 lug into a 10 lug using an adapter kit which includes all the lugs including the chrome outer lugs. Tires have 90% Tread left in them. Like I stated earlier they have only been on the ground for 7000 miles. Tires come mounted on the wheels, tires are trued and balanced. You will get everything you will need to bolt them directly on your Chevy, Ford, GMC or Dodge dually truck. Price for the wheels and tires will be $1800 and an extra $100 for shipping. I accept Paypal as payment and are ready to be shipped as they are packed.